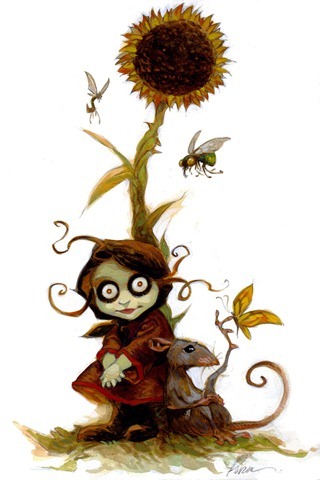 Steve Purcell is an American artist, cartoonist and film/game designer. Perhaps most important of all though, he is also the creator of the hugely popular characters Sam & Max, who have featured in a wide variety of media products over the years including comic books, a TV show and now a return to gaming with their third Season from Telltale Games, launching tomorrow (15th April 2010). He also works at Pixar. What better time to speak to this hugely talented artist and designer? I was recently lucky enough to be able to track Mr Purcell down and pick his brain for the pleasure of AMO’s readers… he even provided us with some fantastic artwork too! Hi Mr Purcell, thank you for your time. Can you tell us a bit about yourself please? I am an adult male biped. I draw and write for a living. I have worked in comics, movies, TV and games. What job title would you give yourself? I’d call myself an Artist/Writer though I also admire the title Mule Skinner. Is it true you used to work at Marvel Comics in your early days? I did a bunch of unremarkable pencilling jobs for them. I did a sword and sorcery book and a mini-series based on a kooky set of toys that never actually came out. I appreciate the opportunities they gave me but I never quite found my style doing "straight" comics. Where did the idea for Sam & Max come from? My kid brother Dave and I would do our own comics as kids. He created a detective duo called Sam & Max. When he would leave his unfinished comics within my reach I would draw the rest of the story in a mocking parody of his style. The characters would make fun of the way they were drawn and forget their own names, and over-explain everything they did. Dave lost interest in Sam & Max and gave me the characters for my birthday one year. That mocking self-awareness has been their style ever since. Have they changed much from their initial design over the years? Oh yeah. Sam & Max were visually very soft and doughy in their first comic. They’ve gotten a bit sharper and more streamlined over the years. In what form where they first introduced to audiences? 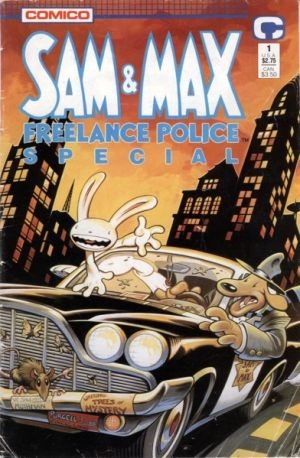 I did my own Sam & Max comic books when I was a kid. But the first time they were published was in my art school newspaper. Sam & Max was not the first strip I did in the school paper though. The first was Donut Driver, based on a night shift job I had for a few months. I also did a Late Night parody strip and another that told how to make the school paper into a kite. At one point I decided to try a Sam & Max strip and I cobbled it together the night before the deadline. I banged out a few more after that but it would be another five years until I would create the first Sam & Max comic book. How did you first get involved at LucasArts? Actually the first Sam & Max comic drew the attention of an acquaintance who passed my name to the Art Director at Lucas; Gary Winnick. He was looking for artists to come work on Skywalker Ranch and create adventure game art and animation. The Ranch was a great environment to work, tucked in the hills of Marin County, it was like summer camp. When we weren’t working we hiked, played softball and I learned to crack a 12 foot bullwhip out behind our little rustic shingled office in the back of the Ranch. Was it your idea or LucasArts’ to make a Sam & Max video game? Max. I was blown away that a Lucas company was licensing something from me. What other games did you work on during your time there? My first assignment was painting a cover for Zack McKraken. After that I did game art for Indiana Jones and the Last Crusade, and then the Monkey Island games which I also did covers for. I did a bit of work on a few others like Pipe Dream and Zombies Ate My Neighbors. What prompted you to leave LucasArts in 1996? After Sam & Max I stayed around part time and helped my wife Collette Michaud develop a kid’s game called Mortimer, about a snail sporting a winged poly-carbonate shell. When I had the chance to go work on the Sam & Max animated series I finally left LEC (LucasArts Entertainment Company). The Sam & Max TV series followed soon after this. What was the level of your involvement and how did the show differ from the comic strip/game? It was similar to working on the game in that it’s very collaborative, lots of people working toward a goal. I was living in a barn out in the country and faxing drawings and notes and receiving huge Fed Ex bundles of artwork every day. It was fun to travel to Toronto to work with the animation crew and be involved in the recording sessions. "It Came From Down There" about how Mack Salmon is breeding Sea Chimps to make food products and there’s another favourite that cracks me up called "The Glazed MacGuffin Affair" about how Sam & Max’s favourite horrible junk food is banned by the government. You later came back to LucasArts to help with the planned Sam & Max: Freelance Police game… what was your role during this project? I was a consultant and so I would drop by the office weekly. Most of the time I would work with Mike Stemmle on the story and create character designs and look at scripts from home. The game was sadly cancelled later on. How close was the game to completion? How did you feel when you got the news? I think it was about two thirds along. I was surprised by the news of the cancellation and I sent out a critical public statement because I didn’t want the crew to be blamed. I never had a chance to react because the fans went berserk and launched an attack on LEC. Did LucasArts lose faith in the adventure genre do you think? Was any reason ever given to you for the cancellation? No, I heard the news from Mike. The execs never contacted me about it directly. I don’t know if anyone involved in the cancellation is still there. I’m guessing they actually believed there was no one to buy an adventure game. It just seemed at the time it wouldn’t have been much more trouble to finish and release the game. I heard you also work at Pixar nowadays! What projects have you worked on with them? I worked as a Story Artist on Cars and have been working on a new movie coming out down the road a bit. I’ll be able to talk more about it soon. Telltale Games later took Sam & Max and brought it back to the video game world with a bang. How was this possible… did this require LucasArts’ blessing? LucasArts’ license ran out so Telltale was able to take on the task of making the new games and only have to deal with me. What is your involvement at Telltale when working on the new Sam & Max games? Usually early on we get together and hash out some broad concepts. We talk about things we’d like to see and do and how to hook up the ideas. Did any of the cancelled game make it into the new Sam & Max episodes? Nobody wanted to retread old ground or breach any copyrights so everything was new in the Telltale episodes. How different was Freelance Police to what we eventually ended up with? Freelance Police was a totally different story, about huge toucan-beaked penguins from a tropical polar island called Subarctica. There was also a high school dance drama and a Burning Max chapter. How did you feel about episodic gaming initially? I always thought it would be a good fit. Even back at LEC, Ron Gilbert talked about wanting to do mini-adventures that you would pick up at the counter of the game store as you were checking out. Ron, Dave Grossman and I brainstormed some ideas for a Sam & Max episodic series. I think smaller adventures are easier to get your head around both in making them and playing them. Favourite Sam & Max episode so far? Still fond of Abe Lincoln Must Die but the new Season is showing some promising weirdness. It will be out by the time this interview is published. Sorry I held you up! Do you think the success of Sam & Max directly led to LucasArts allowing Telltale to create Tales Of Monkey Island? I assume LEC could appreciate Telltale’s capability based on their track record on all their titles. It’s clear Telltale is running a sharp, viable, creative business. Were you involved at all with anything at Telltale apart from Sam & Max? I know you did the artwork for the poster of TOMI! I was flattered that they asked me to do the Monkey Island image. It seems Monkey Island keeps turning up in my career. Speaking of which, I heard an animated Monkey Island film was planned once… can you verify this? I don’t know if I can. I did work on a very piratey feature film pitch with a hapless main character and un-dead villain. It was fun and nostalgic but I won’t go as far as to specify the title. I hope I can always find a way to create or contribute to fun story based projects. To continue to write, draw and paint and hopefully make an audience laugh. Sam & Max Season 3, Episode 1: The Penal Zone launches tomorrow at Telltale Games. Expect a full review on AMO shortly! We may also have some monthly surprises in the pipeline like we did with Tales Of Monkey Island so stay tuned! Update: AMO’s The Penal Zone Review is now live! Cool interview, Marty! I could imagine the Fed Ex guys loving having to lug huge packages to Steve’s country barn every day. Nice pictures accompanying the article, too. Do I take this seriously or not? Incredible artist and inspiration. Always has been – always will be. My favourite piece is still the cover of Zak McKracken and the Alien Mindbenders.